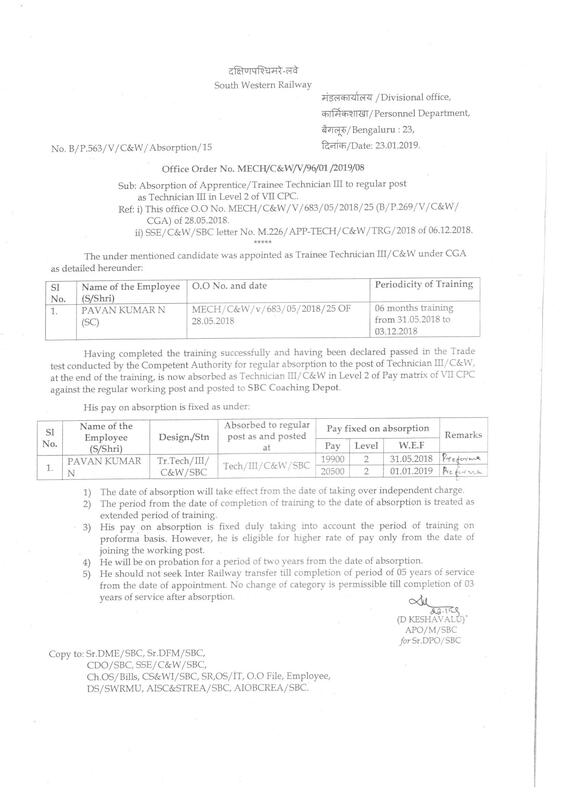 01.03.2019 Promotion to the cadre restructuring of DSL/ Mech. 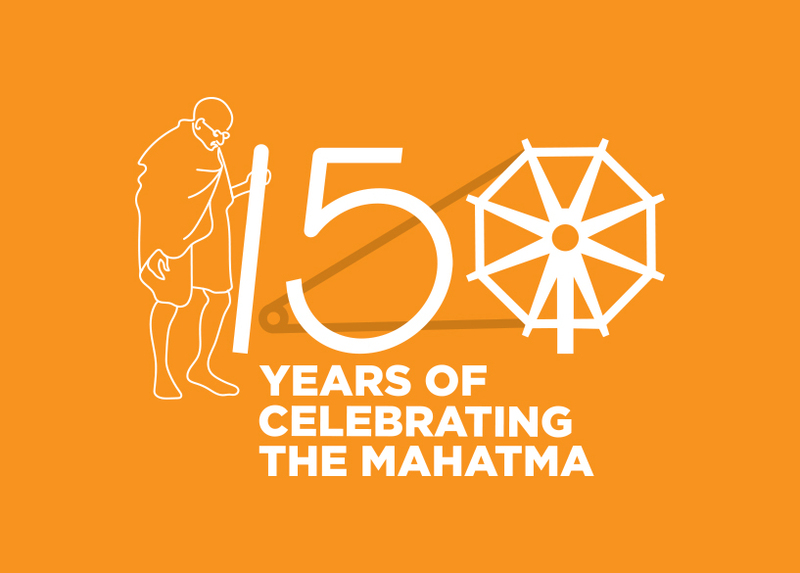 IDMT of Shri. Tamilanban, JE/ SSE/P.Way/SBC. 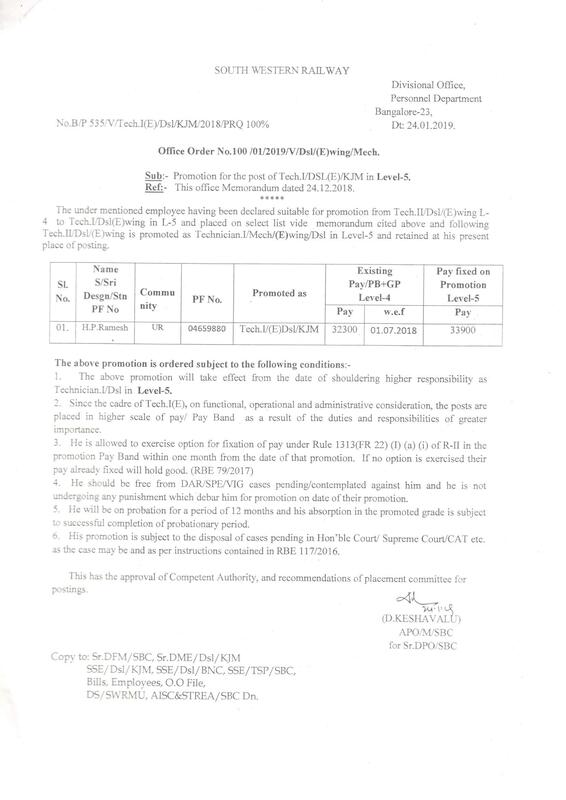 IRMT of TM of Civil Engineering dept. IRMT of Shri. S. Balaji, Sr.ALP/YPR. IRT of Shri. Munesh Chand Bairwa, Helper/ S&T/ KJM. IDT of Smt. Shuba K B, Helper/ C&W/YPR. IDT of Helpers/ C&W to UBLS. Transfer/ Posting of Shri. R. Saai Baskar, SSE/ Works. IDMT of Shri. Suresh M, Helper/C&W/SBC. 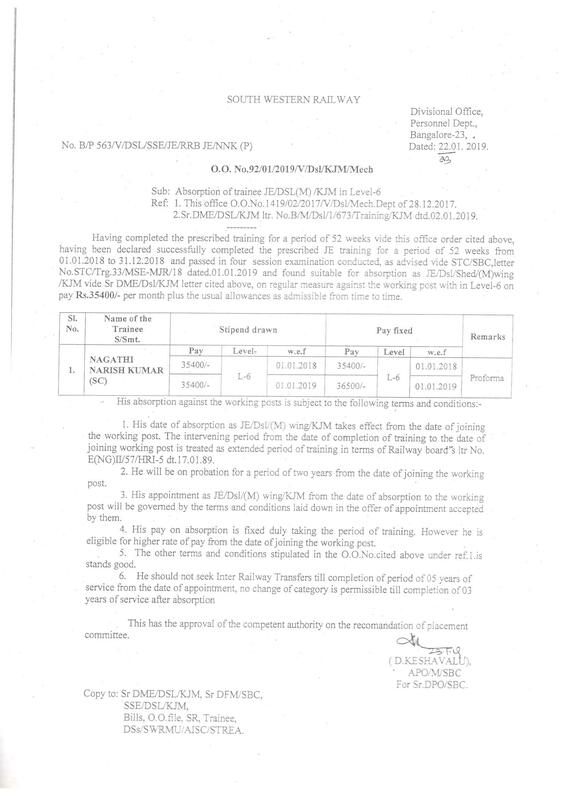 Promotion of Station Masters in level – 6. Promotion to the post of Tech/ II/ C&W. Absorption of medically decategorized staff in alternate post. IRMT of Shri. Marimuthu, Sr.ALP/SBC. IRT of Helpers/ C&W/ SBC to Ajmer Workshop/ NWR. IRT of Shri. Nikhil AM, JE/ C&W/SBC. Placement of Shri. 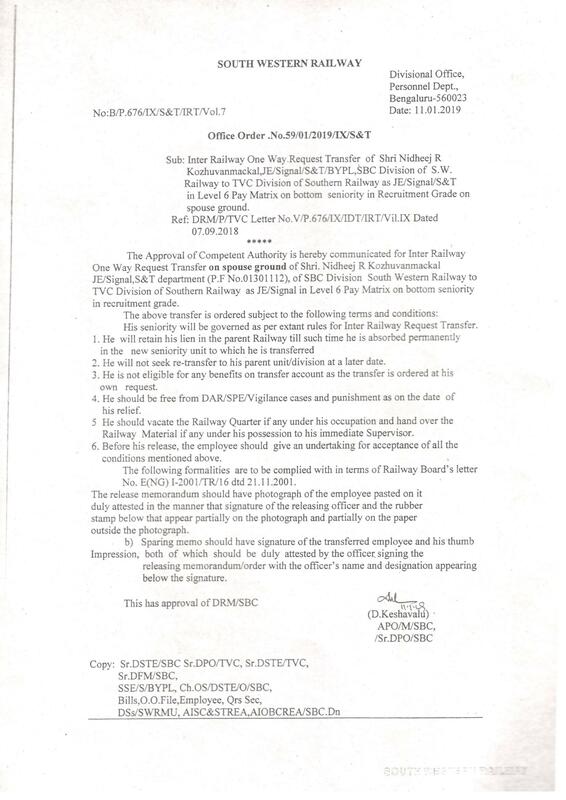 B. Yesu Kumar, Sr.Tech/ SSE/ C&W/SBC in supernumerary post. IRRT of Shri. Suresh Kumar V V, LP/Pass/YBR/SBC. Imposition of Major Penalty under Rule 9. 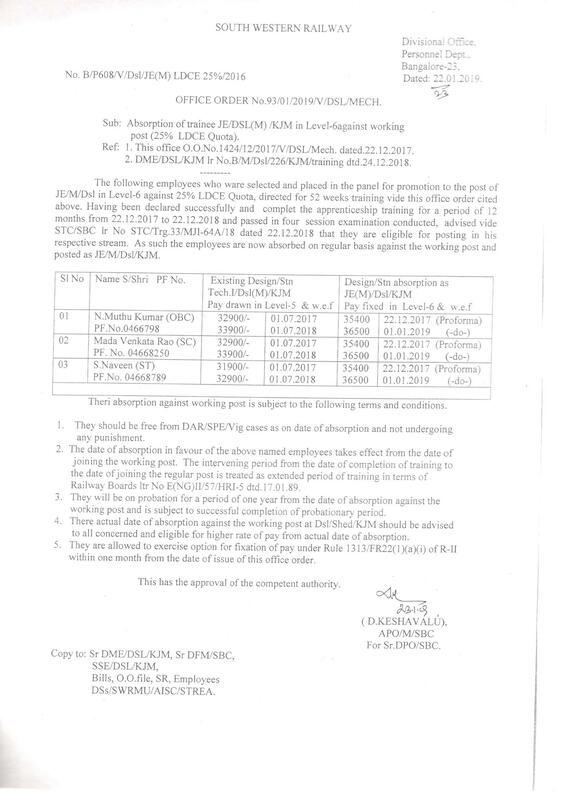 Inter unit Transfer of Lakshmi Devi L, Helper/ C&W. IDT of Shri. Nagosa Pawar, Helper/ C&W. IRT of Helpers / C&W/ SBC. 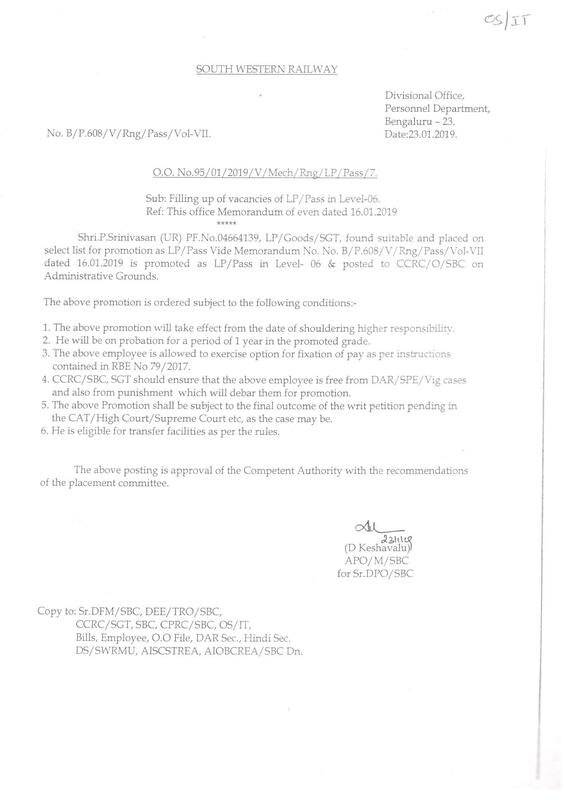 Implementation of MACP in favour of Controllers in Operating department. Filling up of vacancies of LP /Mail. Reversion from Sr.ALP to ALP of Shri. Sanjeev Kumar. Compulsory retirement of Shri. Ravi Kumar S V, Tech/ I/ C&W/ SBC @ DSL /BNC. IRT of Shri. Sanjeev Kumar, Sr.ALP/SBC. IDMT of Shri. Avinash, SM/ YPR. 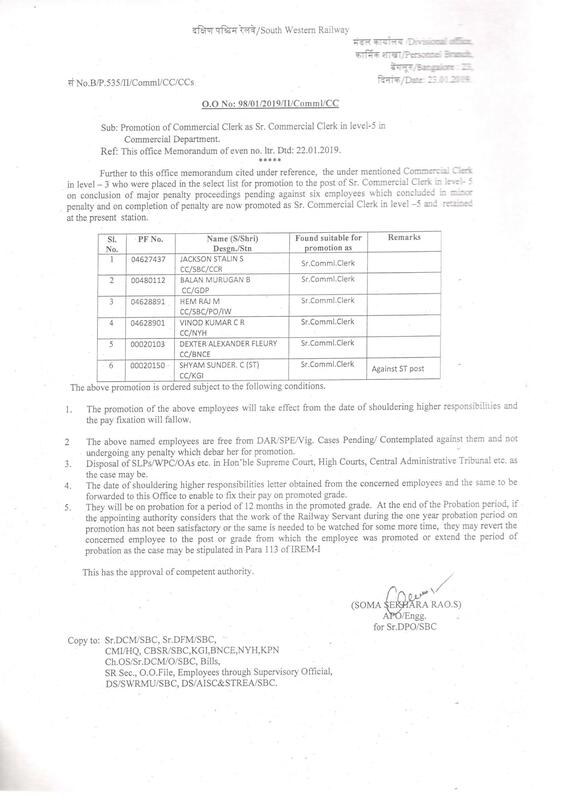 Promotion of staff of Tech/ II/ C&W as Tech/ I. 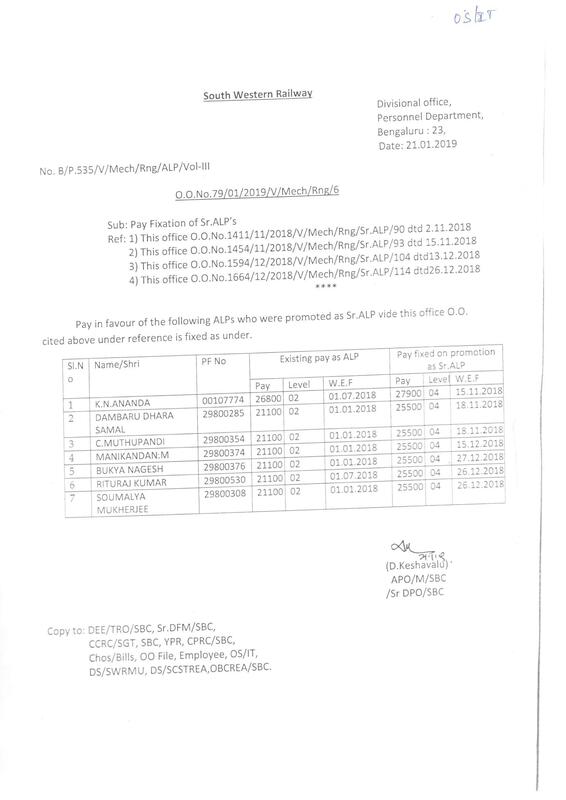 Promotion for the post of Tech/ I/ Dsl/ E/KJM. Absorption of Apprentice/ Trainee Tech/ III to regular post. Promotion of Commercial Clerk as Sr.Commercial clerk. Filling up of vacancies of LP/ Pass. IRT of Shri. Nidheej R, JE/ Sig/ S&T.